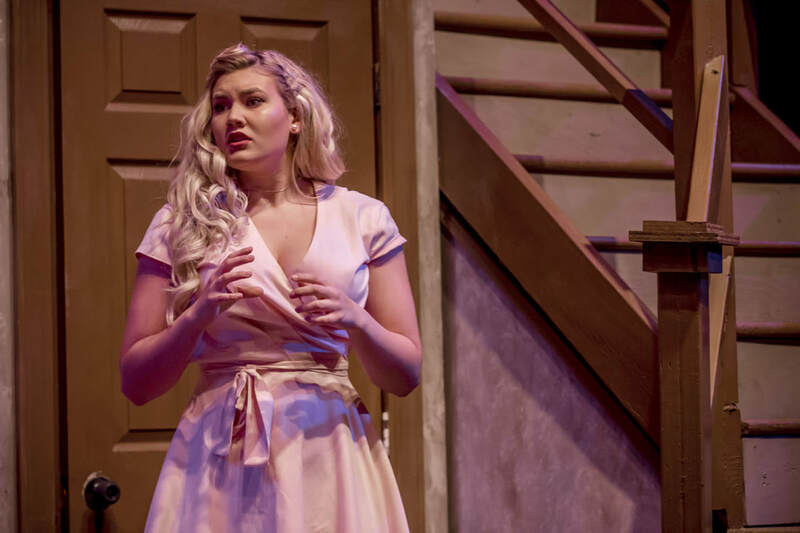 Autumn Carter won the coveted role of Elle Woods in Cottage Theatre's production of Legally Blonde. Actress Autumn Carter is playing her "dream role" of Elle Woods in Legally Blonde at Cottage Theatre April 6 - 29, 2018. What are your feelings about this story and the character you play? "Legally Blonde has been one of my favorites movies since I was a little girl. Back in 2008 I remember watching the TV series The Search for Elle Woods which followed the recasting of Elle Woods on Broadway. This was before I had started acting or became involved in theater -- watching this was actually one of the things that lead me to audition for shows. I was so inspired and amazed by how challenging the role was, both physically and emotionally. As a blonde woman myself, I relate so much on a personal level with this story. The number of times I have been put in a box because of my looks is astounding. This show and story has taught me to always believe in myself no matter what anyone else says. I have carried the morals of Legally Blonde around and I believe it has made me a smarter, stronger individual. The role of Elle Woods has not only been my dream role for a decade but is one of the main factors leading me to start doing musical theater. Going into the audition I was the most nervous I had ever been, just because this role means so much to me!" "There are a lot of challenging things that are involved with being Elle Woods. Elle is on stage 95% of the show and when she off stage she is changing, so this role is demanding so much of me physically and emotionally. When I learned I had gotten the role I started going to the gym multiple times a week just to get prepared to run the marathon that is Legally Blonde. Vocally this part has been so challenging. I have only been taking voice lessons for a few months; being untrained has definitely proved to be a struggle for this show. However, the people I play across from and the directing team have shown nothing but support and guidance through the whole process. ​The strength of Elle Woods and the positivity she brings with her is something that I hope to emphasize while playing this role. Elle Woods is such a complex character with so many layers that people don’t realize. When people think of Elle Woods they think of a bubbly blonde who loves pink. I hope to bring a deeper complexity to Elle in this production. Elle is driven and smart, yet she hides behind her blonde hair because she thinks that’s all anyone will ever see. However, throughout the story she transforms into a strong women who loves herself and believes in herself even if no one else does." "My favorite part about the whole rehearsal process is that every day I get to walk into rehearsal and live as Elle Woods! I’ve waited a very long time to get the opportunity for this show and this role, so every day I get to perform as Elle is a blessing, and I couldn’t be more thrilled. Not only has playing Elle Woods been one of the most amazing aspects of the rehearsal process, the whole cast acts as a family whenever we are together. Getting to be surrounded by people who genuinely love and care about one another is something really special." What are you hoping audience members will take away from this show? "I hope the audience will take home the message of not judging a book by its cover. Again, being a blonde women who is in college and close to graduation, I have been talked down to and ignored in classrooms because of my appearance. I hope audiences will learn to love each other and treat each other with respect. I have to agree with Elle Woods when she said, 'You must always have faith in people. And most importantly, you must always have faith in yourself.'"